Well, it turns out I haven't been being as productive as I'd like to be, but I suppose I'm getting there. My problem is never a lack of ideas, it's quite the opposite...too many ideas and plans! I can't stick to one thing long enough to plan it through all the way. I will come up with something, research it for ever, and then move on and have to start all over when I come back to the first idea. I need to be more organized and carry a notebook around for when I think of new things I guess. I've been working on a few new ideas for the shop, and here's a few pictures of one of those ideas! 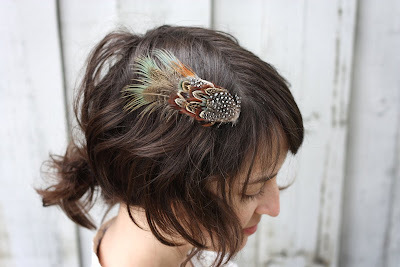 I should have these feather clips up in a couple of days, so keep your eyes peeled. I really like these because they're just hair clips so they're really easy to wear. And now, on a more serious note, we discovered something earth shattering today. Montgomery is a girl. The people we got the goats from told Patrick the blue eyed one was a girl and the brown eyed a boy, so we just never gave it a second thought. 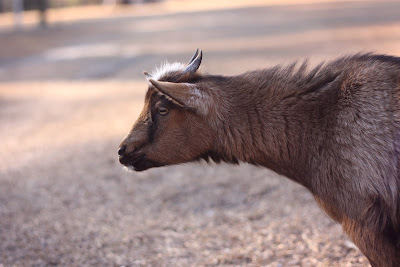 I thought maybe goats were like kittens where it's hard to tell when they're younger. Well we finally studied some diagrams today in my goat books from the library and discovered, oh no, the differences between male and female goats are extremely obvious. Ha! We were about to take Monty in a few days to the vet to get 'his' pre-surgery shot (you know, for the boy kind of surgery). I almost wish we hadn't have found out until we were at the vet, because they would all be rolling on the floor with laughter. So yes, Monty is a lady. At least we didn't find out Lola was a boy... a boy named Lola would never be taken seriously. awww i still think this is the funniest thing! now you have two sisters! are you guys going to get another who is actually a boy? haha :) at least the name montgomery is versatile! now I feel like buying a boy puppy and naming him lola to be anti conventional. 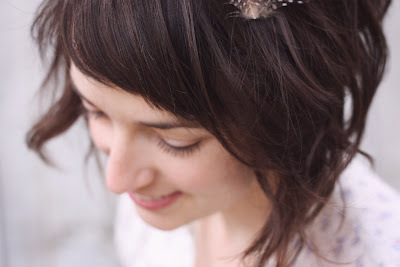 and those feather clips are super super lovely! haha, what kind of "Diagrams?" Like the kind at the doctor's office that leave a lady feeling confused? Im very excited about your little hair clips! They're gorgeous. 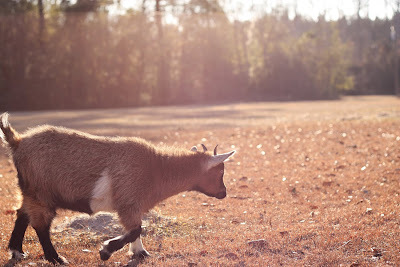 Awww, your goats are so cute, and that story is hilarious! I had a pet gecko once that we thought was a boy for 2 years, and then we found out she was really a girl! Ha! just found your blog and I love it. You have a fantastic sense of style. I would love to see more. by the way, would you like to trade links? Aaand I love your fancy feather clip, especially with your hair color. Perfect together! haha! I love the gender story of Monty! How funny! 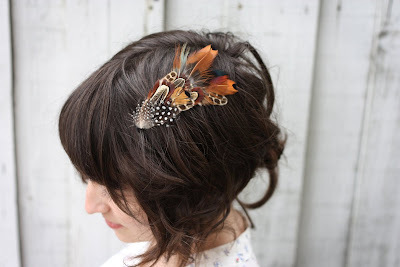 The feather clip is gorgeous! What beautiful hair clips! Will look for them in your etsy shop. Hugs to Monty, I hope she's not in denial after the confusion. Wow goats are such a random pet. I love your blog! Please take a look at mine. That is hilarious! I had a dream that we found out my cat was a boy when we first got her as a kitten. A boy named Madeline would have been very weird. :) But two girl goats is quite fine. I love your goats! It makes me want to have a big farm so I too can have goats!